As you can see in this quick and dirty video that illustrates the technique, white text, for instance, is generated by an alternating shade of red and blue, both colors carrying some level of green. As those colors swap in and out 60 times a second, your eye is tricked into seeing the average of the two colors. Yellow is formed by swapping out shades of red and green, and so forth. Pause the video a few times during the high framerate sections to see what’s happening more clearly. I have seen similar approaches used in a few other places over the years, the first being the early Atari ST game, Megaroids, an Asteroids clone. In Medium Resolution mode it does a color swap every frame to smooth out the details of the asteroids and to provide a degree of anti-aliasing for the player’s ship. The second example I encountered was also on the Atari ST, in a paint program called Quantum Paint which achieves up to 4096 colors onscreen by swapping palettes every frame in Low Resolution, 16-color mode. Over the years I have run across several scenedemos that achieved effectively higher color depths using this technique, as well. 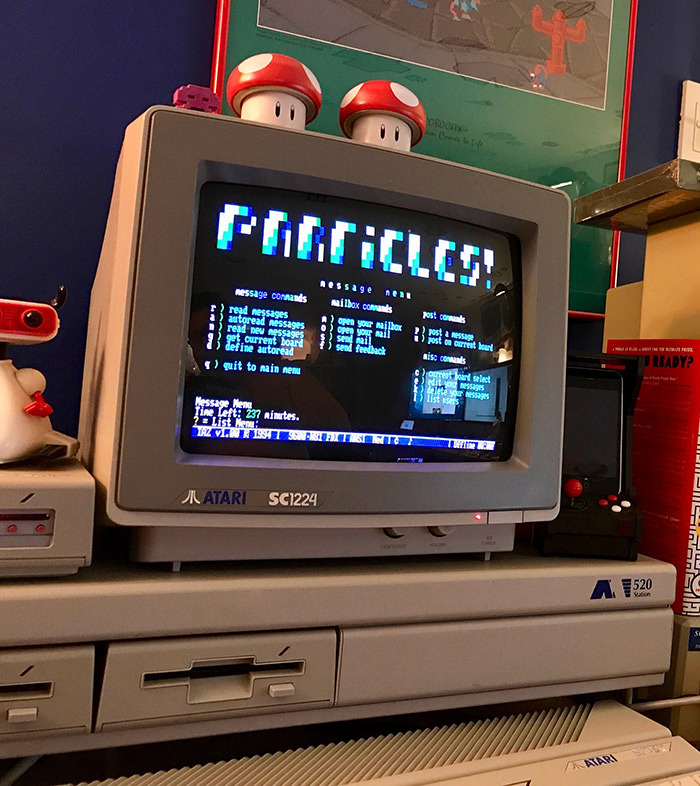 Of the systems I’ve used with the WiFi232 units, my Amiga 1000 with its true 16-color, 80-column screenmode is probably the most capable machine for color BBSing, but the cleverness of TAZ and the quick startup time of the Atari with its HxC2001 has made the 520ST my go-to BBS machine at the house, for the time being. A big part of the enjoyment that I experience using these vintage systems has to do with what they are able to achieve with such extremely limited resources as compared to the technology of today. Seeing a system actually pushed beyond its set capabilities, so to speak, is an incredibly satisfying thing. This entry was posted in Atari, BBS, Serial Terminal. Bookmark the permalink. Interesting stuff. How’s password entry over plain-text telnet implemented? Any encryption or proper authentication possible? I was reading articles and clicked and.. there’s my BBS! That’s awesome, thanks. And the BBS he’s dialing into… it’s 8 bit. It’s all plain-text and non-encrypted, pretty much how it should be in 1997. It’s weird how effective that trick is, even though it should be a horrible flickery mess much like most other attempts at field-sequential colour that operate slower than e.g. the 180+ fps of a DLP projector utilising the technique (and even those tend to switch more frequently and with higher precision using a seven-segment colour wheel – the primaries, secondaries, and white – to improve brightness and reduce flicker / colour trails). Presumably the phosphor afterglow, which appears to be fairly long even at 240fps, helps paper over some of the gaps. Also the use of red, green and cyan is a bit strange … I mean, you need that to be able to show both yellow and white without the latter being a somewhat low-intensity grey that suffers a lot of flicker by needing three frames to appear, but I do wonder how the primary blue visible on one of the screens is produced… and also how it would treat magenta? Maybe it’s that it is actually completely changing the palette on each frame (maybe even line by line, and by that I don’t mean row by row but every scanline, which lets you do some vertical as well as temporal dither, and is a technique I’ve seen used quite effectively on the Oric and even the CGA PC), rather than just flitting between two screenbuffers with different pixel patterns in, and there are six different colours that can appear and mix, plus the fixed black background… between them you might be able to come up with a reasonable facsimile of the ANSI 16…? Especially if dithering vertically you could still manage the already-dithered characters of the standard set by reducing their own dither to vertical bars, though maybe they would still work OK with the technique anyway? Still got an analogue modem in the back of the cupboard so I might have to get an image for that program and dial into a surviving BBS with my own ST when I get it working again, just to witness the effect. As well as Megaroids of course – as noted on its own post page, I’m part skeptical, part extremely curious about what’s actually going on there. It’s not palette flickering but swapping between the halves of a double buffer, that much is fairly plain, but beyond that it’s a bit of an enigma … does it actually interlace, or is it simply going for a bit of temporal anti-aliasing because the roids themselves eat up the palette entry that would otherwise be used to simply draw a pre-smoothed sprite? Alternatively, a different tack a bit like that used for word processors on 8-bits that didn’t have 80 column modes or cards available. Set it into low rez but use deep overscan; 400 pixels width isn’t a particular challenge for demo writers these days (in fact they can manage about 412, but those from about 404 to 408 are blanked out by the most common “stabiliser” techniques that prevent the opened borders on one line causing the next line to be garbled), and that would allow us 80 columns with a 5-pixel wide character cell, which is just about enough to be readable with a bit of finagling of the character set (some of the 8-bit “compressed” modes even used 4 pixels, though that’s really pushing it for legibility). And we can then just set and forget the colour palette. I wonder too whether it might be possible with some clever hackery to effect a half-pixel horizontal shift (find some way to write an odd number of medrez pixels then shift back to low? I have a feeling there’s a hundred reasons why that wouldn’t work, though) and use that in conjunction with double buffering to do a bit of semi-flickery *horizontal* antialiasing of the text? To my knowledge no-one’s tried anything like that… but it sure seems like it would be worth a go. Another idea I had myself ages ago was that… it strikes me that the missing shifter mode really should be a “/3” one. High is /1 (the 32MHz input clock is divided by 1, and the shifter cycle is reading in one word then shifting it out as 1-bit pixels), Medium is /2 (32MHz becomes 16, and two words are read in then shifted out as 2 parallel bits to a pixel), and Low is /4 (…I think you get the idea). On colour monitors the same ~40us active period ends up containing 320 or 640 pixels; on a mono one, only 20us is active, and again has 640 pixels (which is another argument against the possibility of a 640×400 interlace mode; it would work entirely differently to everything else, instead of just being the mono clock on a colour screen… which would itself instead create something like the Amiga’s hopeless SuperHiRez 1280×200 mode). Three of the four possible mode settings (using two bits) are accounted for, but there’s an unused slot. The input clock is fixed at 32MHz, you can only – with that generation of tech – divide by integers, the internal shift registers are only four “lanes” wide (with medium and mono using just 2 or 1 of them), and there’s only 16 colour registers anyway. So … why not a ~10.6MHz, 3-bit-pixel mode? The resulting horizontal rez is a somewhat inconvenient 426.67 pixels if we keep the exact same clock, but there’s no reason that we need to do that. For convenience it’s best if the width is divisible by 16 (our 3-word blocks are going to be 16 pixels wide because of the memory architecture, and the memory *access* cycle runs every 5.33 pixels (x3 = 16), as a read takes two CPU clocks and can only happen every four clocks, which are themselves divided by four from the 32MHz crystal). Timing is weirded a bit in terms of matching pixels to clock cycles across each line, as one CPU clock is no longer 1, 2 or 4 pixels but 4/3rds, so it’s maybe best to think in blocks of 12 clocks which are the smallest that we can reliably time and conveniently also 16 pixels wide (or in other words, just the same as how things are in hirez). The oddest thing being that line length can’t now easily be a free choice of x4 or x8 pixels (or x4 clocks) as it technically was for low and medium, but has to be x12 to not waste CPU cycles (or if we take the Amiga model of halting the entire system for between one and three clocks at the end of each line to “correct” the timing, we could have x6 or even x3 pixels, as well as even freer choices in low and medium). The 512 and 508 cycles of PAL and NTSC are no longer possible; the closest we can get are 516 or 504, which messes up the line frequency somewhat, though 504 with the early ST/STe crystals isn’t even as high as certain Japanese computers routinely ran their “15khz” modes at, and 516 with the later TT/MSTe crystal is easily close enough to ISO-PAL frequency to still work. If instead the timing is jiggled a bit to allow a x6 pixel count (maybe the CPU gets an extra 2 cycles it wouldn’t normally enjoy and the video system is paused, or the CPU is just halted for ~0.2% of the time, or that slack bandwidth is reserved for refresh, audio DMA, floppy DMA, blitting or any of a whole bunch of things down to and including a single 1bpp 16-pixel wide sprite…) we can get 510 clocks. Anyway, that’s bogging down in the minutiae. Upshot being we can have a minimum of 400 pixels within the normal underscan area in that mode, giving us the 5-pixel/80 column setup without any special tricks, and 8 colours to use likewise. More likely you’d go for 416 or 432 which are a little either side of normal width (equivalent to 312 or 324 low-rez pixels), and the latter allowing a variant terminal standard of 72 columns at least with a 6 pixel font. But really, if you’re reengineering the shifter at the last moment to fit this mode in, what you’d want to do is make it 480 pixels wide (equivalent to 360 low-rez). Which with a 10.7MHz clock is almost exactly as wide as the Amiga’s 320/640 pixel modes using its 7.1/14.2MHz clocks, so it would fit nicely within the limits of a typical monitor or TV, and not be so finely pixeled as to lose clarity on most of them. And with a 6-pixel-wide font, a little coarse but not the most unusual of things, there’s your 80 columns. In 8 colours, which is compatible with at least a lower flavour of ANSI. And I fancy it wouldn’t be too hard to come up with a colour switching and/or per-line dithering/palette swapping routine that could make a much more convincing, stabler facsimile of the 8-and-16-colour standard if indeed not the full 16-and-16 colour extension possible with CGA.